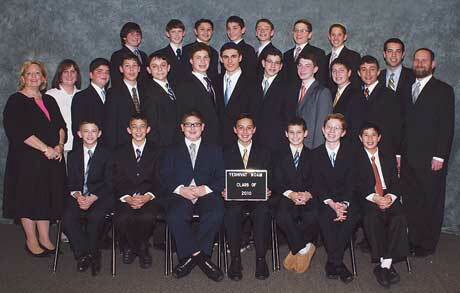 Graduation ceremonies for 23 eighth-graders on June 13 will mark a significant milestone for Yeshivat Noam in Paramus. This group, including kids who started kindergarten during Noam’s first year in 2001, is the school’s first graduating class. The school – which is coed, although all the eighth-graders are boys – was founded in response to a lack of space at Bergen County’s existing day schools. Noam began at a modest Bergenfield location with 50 preschoolers. The older grades were moved to a 3.5-acre renovated Paramus office complex in the 2005-2006 school year, while the preschool remains in Bergenfield. Enrollment for next year tops 700. “I’m kvelling,” commented Harry Mortkowitz of Fair Lawn, who in 2000 accepted the Rabbinical Council of Bergen County’s request to take on the task of creating a new school for the burgeoning Orthodox population. Having served on the boards of Yavneh Academy and The Frisch School in Paramus, he shared the RCBC’s concern that school overcrowding was discouraging young families from moving to or staying in Bergen. He served as president for six years and brought in Rabbi Chaim Hagler as founding principal. “It is fantastic to be able to see the first graduating class and to have watched all along as Rabbi Hagler and his staff have fulfilled the mission statement of the school in terms of the overall development of the child – teaching not just the 3 Rs, but also character development and being part of the larger Jewish community,” said Mortkowitz. The yeshiva emphasizes parental involvement, personal morals, Zionism, a small teacher-student ratio, and Judaic studies instruction in Hebrew. Boys and girls are separated beginning in the fifth grade. Until fourth grade, when test-taking skills are formally introduced, students are assessed academically through alternative means, to establish a non-competitive environment. “At Yeshivat Noam, there are no ‘A’ or ‘B’ students, no ‘honors’ classes or ‘remedial’ classes,” Hagler said. Using a “differentiated instruction” model, teachers form small groups within the classroom and work with students on different levels. Enrichment is available for children who are assessed as gifted. Mortkowitz, who now has a grandchild in Noam’s kindergarten, said he continues to seek solutions to the school’s spatial and financial challenges. “It was difficult to [raise capital] from a young parent body just getting on track with their careers. And while others stepped up, money was the biggest stumbling block and remains that way.” He is now involved in local initiatives to address the problem of spiraling day school tuition. From Hagler’s perspective, “The biggest issue was transitioning from a small start-up school to a more established school, while maintaining warmth and care for every individual child and focusing on being current in research and cutting-edge pedagogy while growing at the same time.” Hagler and his wife, Chavie, are to be honored at the yeshiva’s eighth annual fundraising dinner, scheduled for June 2 at Cong. Keter Torah in Teaneck. Michael Hirt of Bergenfield transferred to Noam in the second grade and was happy with his choice. “There are always smiles on every kid’s face when you walk around the halls,” he said. He and his classmates – whom Naor called a “brotherhood” – often socialize outside of school as well. Instead of naming graduation speakers based on grades, Noam administrators met with the eighth-graders to form a vision of their ideal class representatives. “Then they cast a secret ballot and we took their top few choices to the faculty, who chose from those votes,” said Hagler. Michael said the kids were asked to consider qualities such as leadership, trustworthiness, and commitment to learning. “It was kind of hard because so many in our class have those qualities, but you got to nominate two,” he said.